In order to be an outstanding accounts manager, you always need to be ahead of the game. To carry over and win as an account manager, one needs to balance the demands of the customer and intention of the organization. When there are any hassles that arise from the project side, the account manager is the one who should recognize and manage the process before the client identifies it. The accounts manager does this job when he is in cool, safe and calm manner. Here are a few hints about what makes a good account manager. What makes a Good Account Manager? The goals and priorities of the organization are an aspect, which a knowledgeable account manager would know. Only a knowledgeable account manager has the capability to embrace and bring out true value. The accounts manager knows the organization and the product and service. The person also learns the competition in the industry and also the strength, vulnerabilities, and weakness of the battle. They will also learn and possess the knowledge about how to compete in the competition by enunciating unique value. A perfect and successful accounts manager is one who is customer relationship oriented. In order to have interest from their heart, clients must first trust the account manager. The relationship with the client must be nurtured and must also go beyond, where the client must be valued. The main factors that make an account manager successful are the prices of the company and business terms and the quality to be consistent at times. Trust is the main factor that makes clients be loyal to the company, though; competitors provide them with a better price. Effective communication is an important parameter which is required for building rapport with one another, presentations to take place, communication with others through email, phone and to write down detailed reports. A good communicator is one who easily articulates the products and services to the clients in a convincing way without compelling. An accounts manager can be pushy, but the fact is that he should not lose sight of the goals and intention of the organization in the generation of results. Maintaining profitable accounts is achieved by the accounts manager by understanding the needs of the clients, establishing a perfect rapport, building trust, and more. With all these, the person is also required to monitor sales activity and also looks out for ways for selling the products as well as services. The account managers make use of client retention strategy and also involve in the generation of recommendations from the present clients. A business insight is also an aspect to be possessed by the accounts manager. There may be business trends and shifts that take place in the industry which must be known by the individual. The account managers are ones who catch hold of new ideas of growth and hold upon those opportunities. They also possess the capability to measure the pros and cons and also maintain a balance of the data along with decisions as they have the best experience and also execute the best decision. A good account manager must diagnose everything before they sell to the client. But there are few account managers who lack confidence but pretend as if they are confident. They work and try to follow the same previous projects without analyzing. They also forget to ask questions to their clients. It is mandatory for account managers to ask questions which make their sales session quite easy. They will possess ample knowledge about the aspects of selling and what to promote when they go in for an added solution or sales. They are able to figure out the aspects from previous projects and make use of them with their present clients. They also have the knowledge about who takes decisions on the client’s side and what happens within them. It is through emails and phone calls that communication with a client takes place, there are few scenarios where the client and manager do not meet at all. In order to compensate for the lack of face to face meeting, the account manager understands the importance and over-communicates with the client. By this way, the client is satisfied and confident and understands that everything is under control. By this way, the account manager is one who is in touch with the production team. The account manager would be able to handle things though they were not in the right position or to be delivered late. Competence is something that has no substitute in the industry. It is evident to be aware of the industry and the happenings in order to be over communicating and questioning account manager. It is important for an account manager to read news like PSFK, Mashable and other industry blogs to be aware of the happenings around. Perfect accounts managers do not do the same and read the same aspects as other managers do, they have their unique way in enhancing their knowledge about the industry. They gain news from a number of other sources than the usual routine and associate their knowledge with other colleagues. So to watch out for specific traces in the industry, they make use of Google alerts so that they gain sources what others are following. Pre-meeting is something all account managers are prepared for. Before they can gather for a big meeting or presentation, the accounts managers are able to gather up for a pre-meeting with the client and production team. • There weren’t any surprises and shocks in the meeting. The accounts managers are proactive, ultra-prepared and they respect everyone. The account managers are ones who are good at ego management, they are pleasurable to go around and manage things. They remember client’s birthday and also make the production team happy by buying them drinks. They are able to handle things when they are in an unavoidable million-dollar team along with senior people in the meeting. When situations occur where they are outgunned politically, they utilize project management skills as well as emotional awareness technics and make sure they keep going forward. They are aware of times when to step forward and when to walk on toes. An accounts manager is one who is smart, curious and also capable. They understand that they are ones who are juggling between two relationships and hence understand the situation of the clients as well as the production team. A good accounts manager has the sound knowledge about when to push and back down the production team. They are aware of the fact that the agency team is the same though there are new clients and projects that happen. It is an important asset for the account manager to be visionary; he should be one who helps others and be surprised about the happenings. The accounts manager must be ones who are able to navigate on the client’s side and respectfully challenge them. They are ones who possess a zone of comfort with pressure. They are able to handle things that are coupled with tension. They also respect the team at times, progress is required so that the team also works far ahead desired for the manager. A successful accounts manager gets to know the basic change that takes place in the work environment. Hence to cope up with the same, they are ready for any training and development program. They are ones who do not rest and the fact that others respect them are their constant interest in enhancing their knowledge and liabilities. They are ones who seek for chances in order to excel in the areas which they consider are important. A good accounting manager is one who looks out for the best business management for their clients and also assists the client in managing the business. They are ones who are aware that business is a deal which is profitable for both sides. In order to make sure that services are delivered on time without delay, an account manager should make sure to be well-organized. They should be ones who are able to manage them effectively. They must be aware of prioritizing tasks and rearrange aspects when required. Securing the contract is the basic aspect for any accounts manager. The accounts manager would definitely try to pitch the clients and complete the deal when possible. The accounts manager also requires the capacity to negotiate any contracts and route the business to success. The accounts manager must be one who is able to read the people and associate with them in a meaningful way. The relationship is the link through which all success is achieved. The account manager knows when to take up a lead in the relationship and when to allow others to take a lead too. Their main aim would be to develop a web of relationships of many amongst the clients’ people and the organization. When the relationship web is more, the greater the partnership would be. The basic parameter for any account manager is their workflow system that they follow. They should have a system that plans and brings out how things are to be done. The system should make it clear about what needs to be done, where to be done and by whom to be done. In order to get organized and focused David Allens “getting things done”, can be referred. It is also a good habit by the account manager to maintain an inbox zero strategy as checking your inbox takes up more of your time. Listening is an important skill that all accounts manager should possess. The manager should have the habit of listening to the complete session before talking. When discussing with the client, it is really important to listen to the client first. Accounts manager learn from listening about what the clients like to achieve. In the same manner vendor relationship also requires listening to their ideas and suggestions. In professional as well as personal life, accountability is considered as an important aspect. In the marketing scenario, it is especially important to hold on people who are accountable for certain aspects. There may be situations where you need to hold the client for few things. When you need certain things to be done or to complete any task you can also hold the client if required. At times when the manager deals with a specialist, they need to look out if deliverables are delivered on the time as described. These are a few important hints that are to be present as qualities in an accounts manager. The accounts manager needs to multitask and hence needs the patience in doing any chore. 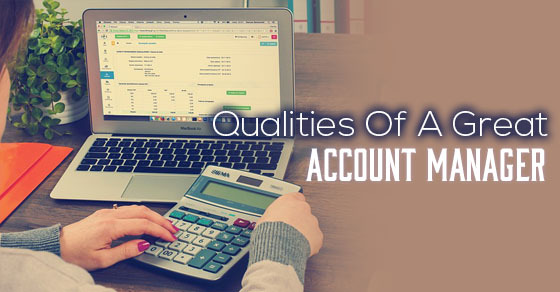 The attributes, characteristics and skills needed for account manager has mentioned above. Those who are willing to become accounts manager can run through the above pointers and get to know what needs to be done. These tips are helpful for any accounts manager who wanted to succeed in his career.